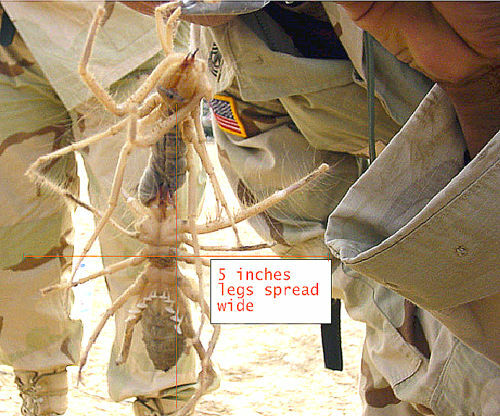 The so called "Giant Camel Spider" is the arachnid solifugae whose adult size is never bigger than the hand of a man. Perhaps nobody would have ever – or rarely- heard of such a creature if it was not because of the tales and photos the United States Servicemen in the Persian Gulf War and afterwards the Iraq War carried back home. This photo was published on the internet in the year 2004 and is not a fake... However, if you look carefully at the size of the sleeve, it is possible to see that this arachnid is not as big as it first appears to be. It is just a matter of lens and optic. Yes, the Camel Spider is indeed a large creature, but it is not bigger than a frisbee or a dinner dish. Actually, it can seldom reach a leg span bigger than 5 inches. It cannot jump over one foot high, and contrary to what the legend says, it does not eat camel's stomachs. Instead, it waits under the shadow of a dead camel's body to eat insects and other animals who do feed on rotting meat. Click on the links in the context menu to learn the "real" inside aspects of this specimen.